There are so many options when it comes to choosing the correct stair nosing for your specific situation. Since countless different companies specialize in certain types of stair nosing, the buying process can seem overwhelming at first. Decide which companies supply the types of stair nosing that fit your need or application. 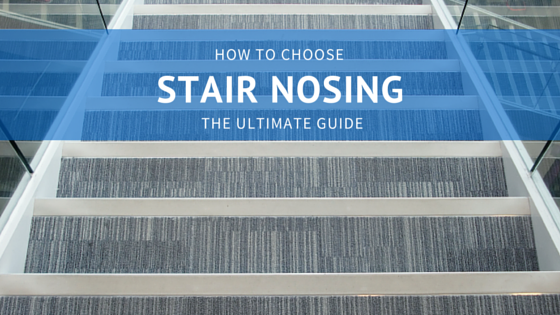 Address specific questions about your stairs in order to select the right stair nosing. Which company sells the right stair nosing for your need or application? Does the company specialize in residential, commercial, or industrial stair nosing? Some companies that manufacture stair nosing work only with the residential market, while others work completely with the commercial or industrial market. You will want to make sure that a company can take care of your needs before doing any further research into that company’s products. What is the environment like where the stair nosing will be installed? Stair nosings have very specific functions. If you know that your area will be getting wet or will be subjected to extreme temperature changes, you will want to ask if the products provided by the company can stand up to those conditions. Also, a huge consideration is whether the stair nosing will be used indoors or outdoors. Only certain products that can be used in an exterior setting. What type of material do I want for my stair nosing? Stair nosing can be made from different materials and also have different finishes. Some common materials that are used include aluminum, PVC, rubber, bronze, brass, and wood. The setting in which you will be installing the stair nosing will help determine the type of material and finish that will work best for you. For instance, if you’re working with an opulent hotel lobby that has a very visible staircase, you may want to use a brass or bronze stair nosing (if it fits within the color scheme of the lobby). If you’re going to install the profiles in a backstage area of a theater, you may want to go with a more basic stair nosing, like aluminum or PVC. How much money do I want to spend for my stair nosings? Do the company’s options fit into my budget? Like most things that we purchase, there is a huge price range for stair nosing. For example, the Gradus stair nosing profiles that we carry start out at around $2.00 per linear foot for a basic flexible PVC (rubber) stair edging and reach over $50.00 per linear foot for a bronze stair nosing or a lighted stair nosing. Knowing your budget will help determine if the company has anything to offer for your situation. How heavy will the traffic be on the steps? 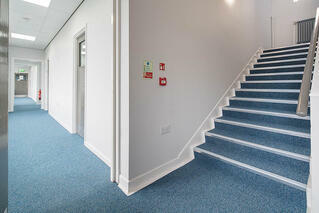 Steps with light traffic will not require the same type stair nosing as for those with heavy traffic. Typically, you can use thinner and less expensive stair nosing when your traffic level is low. Conversely, a more durable profile is optimal for steps that will have a high volume of traffic. Of course, you will have your own questions that will need to be answered before making a decision about which companies may be able to fulfill your needs. Once you have narrowed down the field of manufacturers, you will want to address more specific information about your stair nosing needs. Below, I have listed some additional questions to help you identify which stair nosing is the best fit for your needs. What shape and size stair nosing will I need? Stair nosing not only comes in various materials, but is also produced in many different shapes and sizes. Some questions that will help you choose the shape and size you will need are as follows. What are you planning for the tread part of the step? Do you plan on adding anything to the tread part of the step? Or do you plan to keep the step as is - concrete or wood with no other product? If you aren’t using anything on the step other than the concrete or wood finish, you will want to choose a stair nosing that ramps down in the back to a flat surface. If you are installing carpet, VCT, ceramic or any other surface on the tread portion of the step, you will need to make sure that the stair nosing you choose is the same thickness as the flooring material. So, if your carpet is ¼” thick, you will want stair nosings that is also ¼” thick to prevent a trip hazard on the back end of the stair nosing. What is the shape of the front of your step? Is it a straight right angle? Is it curved? Is it raked or slanted back? Although most steps are a straight right angle, there are also steps that are curved or raked/slanted back on the front. 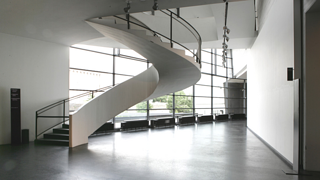 You will need to choose stair nosing that is as close as possible to the shape of your step. This will help ensure a tight fit for your stair nosing, which will result in a safer and more effective installation. Even if your step is a standard straight right angle, there are options available for a more dynamic and decorative finish. 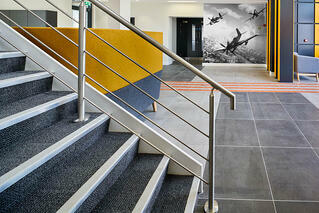 Gradus has several different profile shapes that will work well with a straight right angle step. 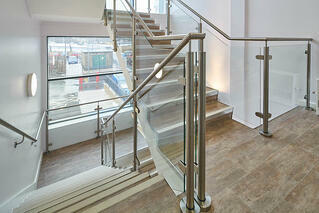 As you can see, there is much more to selecting the perfect stair nosings than meets the eye. I hope that this gives you a little more insight and helps make your search less stressful.